– A little about yourself. What is your path to SmartFrame? I have been an entrepreneur for over 20 years now, having set up and run businesses in a diverse range of market sectors, including music and entertainment, health and fitness, mobile phones and office supplies. In 2015 Pixelrights Limited approached me to help define their market strategy and secure funding for their business. Upon evaluating the business opportunity, I was immediately impressed by the technology that the Founders Shaun Curry and Patrick Krupa had developed. Their focus at that point in time was to provide a unique portfolio website service for photographers, and whilst reviewing what was currently available on the market, I could see they had created the most user-friendly interface available and had a strong group of followers along with some really great reviews. This was impressive, but it didn’t stop there. In addition to making a really simple platform for photographers to showcase their work, they had also focused in on how they could help to protect their copyright too! And in doing so invented a new image technology called the SmartFrame. This was the convincer for me and so I joined their board and became a shareholder, and 12 months later we’d secured our first £1m round of funding and grown from a team of 3 to 15, whilst bringing on some very heavyweight talent into the business and onto the board. 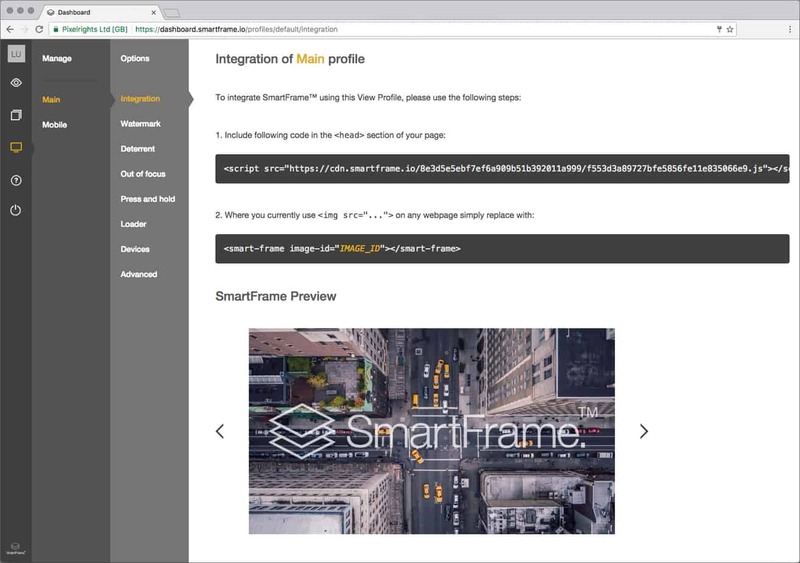 Whilst the portfolio website service still goes from strength to strength, this year a key focus for us has been on the development of the SmartFrame functionality and extending this technology to other platforms and across the internet. Our ultimate vision for the SmartFrame is to redefine the digital image standard, raising awareness to and protecting copyright, whilst enhancing the viewer experience, and generating new revenue streams for content creators. – What is SmartFrame ? what does it solve? The SmartFrame is a patent-pending interactive image technology that allows the user to add interactive content to their images and present them in a secure manner. Our technology takes the JPEG and converts it into an encrypted file which is unreadable to viewing and editing software. At anytime the content owner can configure or re-configure how they wish the technology to perform and add interactive content such as affiliate adverts, dynamic watermarking, credit & caption info and sharing tools. Decryption keys run in the background that decodes the image on request and reconstruct the image on the page. These keys can be modified and change the way the SmartFrame behaves, meaning the same image can be displayed differently to different websites, devices or audiences. Alternatively, we can host the users SmartFrames and provide them with simple Embed codes that can be hosted anywhere with no need to run decryption keys. – Who is it for ? large photo archives, independent photographers or brands ? There are many applications for the SmartFrame and it is by no means limited to the photographic industry, where it was originally conceived to help raise awareness of and protect copyright. Indeed, we’re getting some really great interest from a diverse set of marketplaces including brands, fashion, e-tailers, real estate and automotive platforms. There really is so much on offer and we consult with our clients to configure and integrate the SmartFrame technology into their platforms and workflows to ensure it performs to their exact requirements. The photographic sector predominately seems to value the control and protection it offers, along with the traffic it drives back to their platform increasing sales of their content. Brands value the business intelligence and marketing data it can provide. Fashion retailers enjoy the dynamic nature of the technology and having the ability to change their marketing messages retrospectively across all their content. For example; adding a seasonal special offer instantly across all their content, and then once the promotional season has ended, being able to revert to standard RRP, or even change the content to next seasons range wherever it is already hosted, all instantly from their SmartFrame control panel. Other platforms such as real estate and automotive like the viewer engagement aspect, providing deep zoom of the vehicles or property, tagging elements within the image and providing a richer viewer experience to help increase inquiries. And some want to monetize their content in new ways, such as running relevant affiliate advertising within the image or making commissions from the sales of the products featured within it. – Does it work on social media ( Facebook, Twitter, Instagram, Pinterest) ? Although the SmartFrame works on all browsers and devices, currently the social platforms don’t accept the SmartFrame format, however, we do offer feature built-in sharing options for all the major social sites. We serve them small watermarked thumbnails which then link back to the full high res SmartFrame version of the image on the hosted platform. This is fully configurable and you can determine how you want your content to interact with the Social sites, be it a small thumbnail, full JPEG, watermarked or not, the choice is yours. – Besides persistent attribution, can it help generate revenue and how ? Yes, I really see this as a major step change for content owners. The digital age has changed the world around us, and I believe content owners need to embrace this change and redefine their market proposition and revenue models for the future growth and potentially even survival of this industry. In today’s world the sheer volume of content is phenomenal, technology has made it extremely easy for anyone to produce, distribute and share good content. This year over 1 trillion images will be taken, 80% of which will be on a mobile device which can be published online instantly. Today’s generation are prolific content sharers and consumers, and they have grown up in a world of FREE! In any market, oversupply diminishes both value and opportunity. So, I believe we should be approaching this differently, rather than swimming against the tide of change, we should embrace and jump on the proliferation bandwagon!! I see the opportunity to openly share and indeed encourage the use of our content for free, but in the form of a SmartFrame, in this way we can monetize our content in new and more profitable ways. Just imagine the value of the data you can receive – how many times your content has been viewed, where and by whom? Becoming an influencer with your content wherever it travels online and capitalize on the eyeballs viewing it, in the form of sponsorship from brands, commissions from product sales of the content within the image, or relevant affiliate advertising fees. – What is the motivation for publishers to use SmartFrame? SmartFrame can afford the publishers all of the same benefits, providing them protection of the content they have purchased, valuable marketing data, new ways to communicate and engage with their audience and additional revenue opportunities. – In the advertising model, does it beat ad blockers? Our full advertising and affiliate model is still in development and we’re looking at ways we might address this, however, if someone is determined not to see ads, then there’s probably little value in serving them anyway. – Does SmartFrame help in discovering what images work best? Absolutely, the SmartFrame will feedback which images are being viewed and shared the most and where and by whom! 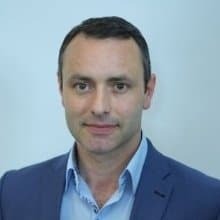 – How does SmartFrame generate revenue? what is the business model? We have a number of revenue generation models, from very low cost per active SmartFrame licensing, full enterprise level integrations, through to affiliate and advertising revenue sharing. – What would you like to see SmartFrame offer that technology does not yet allow you to do? Ultimately we want to redefine the digital image standard and would like to get all the major search engines, social platforms, and even digital device manufacturers to embrace the SmartFrame format so that it becomes the defacto image format for all.